Bravo! Vail's community outrach activities are a large part of the festival season, in addition to the world-class music. Community events include Little Listeners at the Library, a series created for its youngest audience members. “My children are able to attend Bravo! Vail’s incredible concerts; meet accomplished musicians; touch and play violins, cellos, trumpets and drums; and learn to play the piano with the help of Bravo! piano teachers in the festival’s community outreach programs. They are inspired to try things that may have otherwise been unattainable and get access to the support they need to do so … I am truly grateful for the opportunities that Bravo! Vail has afforded my family,” said Vail Valley parent Cindy Goodwin, whose children have participated in Bravo! Vail’s Piano Program for many years. Bravo! Vail’s community outreach activities are a huge part of the festival season. By presenting events in Vail, Avon, Edwards, Eagle and Gypsum, Bravo! Vail strives to reach audiences of all different ages throughout our community. We visit our valley’s hospitals, summer camps, libraries, senior centers and fellow nonprofits to present free programming that showcases our amazing musicians as performers and communicators. Our goal at Bravo! Vail is to not only present concerts of the highest artistic quality, but to also communicate to audiences the power and joy of music-making. All of our musicians speak at their performances and invite each audience member to participate in the live classical music experience. Through our special collaborations with Vail Health and Roundup River Ranch, we take the concert experience out of the hall and bring it to audiences that would otherwise be unable to attend. As part of this collaboration, Bravo! Vail musicians perform for doctors, nurses, hospital staff and patients at Vail Health’s campus in Vail, Shaw Cancer Center and Jack’s Place. With each of these events, Bravo! Vail furthers our mission of bringing a lifelong appreciation of music to our audiences, no matter where they are. Bravo! Vail’s festival musicians travel to Roundup River Ranch each summer to perform for campers, who are children with serious illnesses. Through our collaboration with the amazing team at Roundup, our musicians perform a short program for the campers and then help each child try an instrument themselves at an Instrument Petting Zoo. It is a privilege for Bravo! Vail to be invited to share music with these campers and staff, and it is a highlight of our season. Ensemble Connect is a two-year fellowship program for the finest young professional classical musicians in the U.S. that prepares them for careers that combine musical excellence with teaching, community engagement, advocacy, entrepreneurship and leadership. Based at Carnegie Hall in New York City, two groups from Ensemble Connect have traveled to perform in Vail since 2017, and we are thrilled to have them back this summer. The group returning this summer will join Bravo! Vail’s artistic director Anne-Marie McDermott in a special chamber performance on Tuesday, July 17, at Donovan Pavilion. 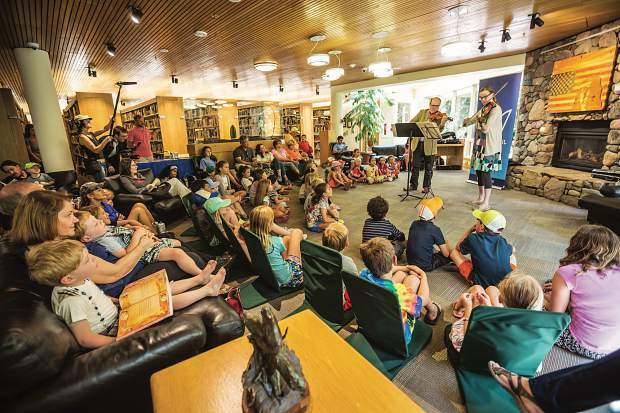 Additionally, they will present a plethora of community and educational programs throughout the valley during their residency, including Little Listeners at the Library, Bravo! Vail After-Dark and a unique program for senior citizens at Castle Peak Senior Living in Eagle. The ensemble will also lead its second annual High School Musician Workshop, an event in which local music students are invited to join the musicians to not only play music but also talk about working as a professional, studying in college, managing your time and commitments, and more. Bravo! Vail and Ensemble Connect feel strongly that building relationships with local students is a priority in inspiring the next generation of classical music. Little Listeners at the Library is a series created for our youngest audience members. Children ages 6 and older are encouraged to attend these events hosted by local libraries. The musicians present programs that allow children to explore and create their own stories. The credit for bringing these young people into the world of classical music at such an early age goes to their parents and families. By exposing them to music at this age, families are already preparing their little ones for attending concerts in the future. For more information on Bravo! Vail’s education and community engagement programs, visit http://www.BravoVail.org. Keelin Davis is the Bravo! Vail education manager.